30,000 square feet of dedicated family fun (for all ages) awaits you at Just Jump Trampoline Park in Panama City Beach! Whether you’re a parent looking for a safe, fun and clean place for your kids to burn some energy or you just want a new and exciting way to get active, Jump Jump is an ideal location for you to do so. You’ll find a tumble track, two Soc-Air courts, dodgeball. basketball, a double trapeze, a Gladiator Pit, a Ninja Course and their oh-so- popular Air Bag within the walls of this epic play zone. 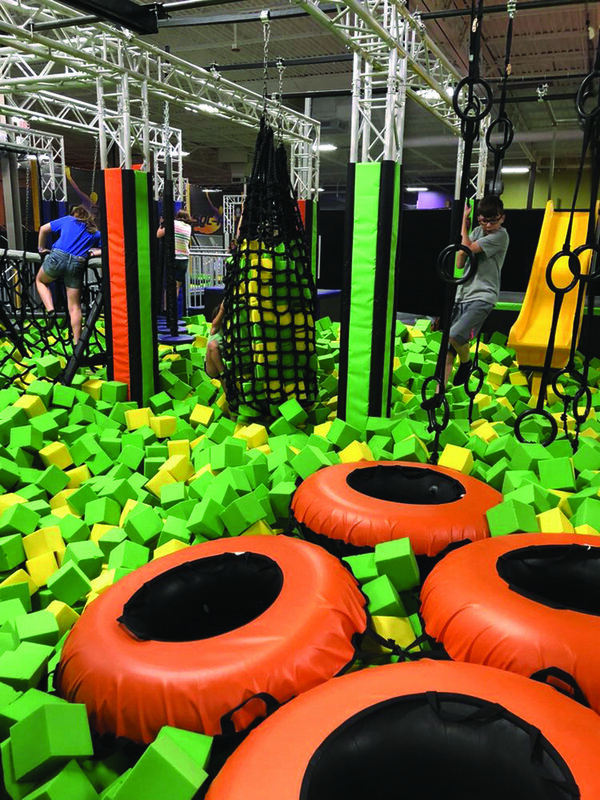 There’s even a Kiddie Area for jumpers who are 6 and under with a huge play structure, separate trampolines, a foam pit, a climbing wall, and basketball goal! For only $15/per hour (per jumper), you can have full reign of the whole place. They offer group discounts! On Monday nights, they offer family time from 5-9pm – for just $30, a family of four can spend an hour playing and running all of that energy out. They do require grip socks, but sell them on premise if you need them! This state-of-the-art facility is complete with a large open jump area, the latest technology and unique designs to captivate the attention of any visitor – even those who don’t wish to engage in the fun themselves. If you’re supervising, you can treat yourself to a bout in their massage chairs or you can watch the fun from above on the mezzanine. Not only is Just Jump a great option for the family, but it’s even better for parties. You can have the best birthday ever by letting them handle all of the details for you. They also have fantastic rates for school field trips, church groups, and group events of any size. Have you ever wanted to be part of a mystery? To be able to boast that you’ve survived a deadly plague? Or maybe you just love solving clues like Sherlock Holmes and John Watson, or an FBI agent tracking down a security threat. Well you can be all these things at Escapology in Miramar Beach. Step into the escape room and travel around the world to Cuba, Budapest, or Shanghai, solve a clue hunt during WWII, or fight outlaws in the wild, wild west. This coolest activity on the coast is open rain or shine and is a great activity for family or friends, allowing up to six people to play at once. Escapology escape rooms set you up as a detective solving the clues present in a room. Head over to their website, www.escapology.com, to find the perfect scenario. You can check out a description of the escape room and even view difficulty ratings to ensure that you pick the right room for your crew, each room created with attention to every small detail to make the scenario as life-like as possible. Book online to pick which game and time you want to attend, and then head over for your reservation for an hour of fast-paced, critical thinking fun! You can use code ESCAPE2018 for a discount when booking. You have 60 minutes. The clues are there. You just have to find them. Succeed, and your legacy will live on in the Hall of Fame. Fail, and you will not survive. Do you have what it takes to escape? With a mission to act as a beacon for coastal conservation through marine animal rescue and rehabilitation, encouraging awareness with public education and opportunities for active participation, it's no wonder we have chosen the C.A.R.E. Center at Gulfarium to be one of our Coolest on the Coast picks this year! The staff who work tirelessly here, are true heroes to our coast. Time and time again over the years we have witnessed the C.A.R.E. Centers amazing efforts to rehabilitate and release various species of sea turtles brought to them or rescued from debilitating situations. From the large Leatherbacks coming in at over 600 pounds to the smaller Green Turtles, we are so fortunate to have a facility like the Gulfarium here On the Coast! The hundreds of people who gather for a turtle release back to the Gulf are always eager to learn and understand the balance we humans play with nature. It's just so exciting and such a great opportunity for the public to learn about the C.A.R.E. Center. So what do you do if you find a stranded animal? Well, you call 1-888-404-3922 and observe the turtle at a distance until help arrives. If you try and help and push it back into the water, it might restrand and die so it's best to sit tight with your new found friend and observe. Here's a few more tips while visiting our coast and what you can do to help the sea turtles out. First, if you've been enjoying our beach, when leaving, make sure you fill in ALL the holes you've dug up and flatten those sandcastles and sculptures. This gives a clear path for the female sea turtles who are nesting and those cute little hatchlings. Also keep the exterior lights off of your homes and avoid using flashlights, fireworks and bonfires from May through October. Turtles use the moonlight to help navigate and those manmade light can be confusing to them. So be a good neighbor to our sea life and do your part to help them survive.